Mohammad Nazmul Hossain is a Bangladeshi cricketer. 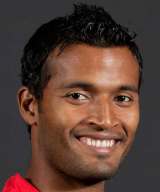 He was born October 5, 1987 in Habiganj, Bangladesh. 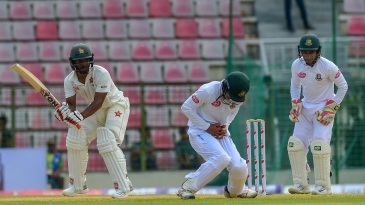 Nazmul Hossain has an angular delivery style pretty similar to that of Makhaya Ntini but not as quick. He was the top wicket-taker among Bangladeshi pacemen in the last Under-19 World Cup but his deeds probably did not get the attention they deserved because of all the oohs and aahs Shahadat Hossain was evoking for his hostility. Nazmul is an honest bowler who sticks to an off-stump line with the natural angle taking the ball in. But the dangerous one is the delivery which straightens or just moves a shade away - batsmen don't expect that from a bowler with his kind of action. He made his Test debut in the second Test against India at Chittagong in December 2004 but hasn't been picked since. He made his debut for Dhaka Division in 2006/07 and scored one first class fifty in his first season, an unbeaten 65 against Khulna Division. His outstanding performance came in the one day arena, with a blistering knock of 144 against Rajshahi Division. Find Nazmul Hossain profile and stats of batting, bowling and fielding including latest updated news of Nazmul Hossain, videos and images at Hamariweb.com. Also find detail Player profile and career statistics of Nazmul Hossain of Bangladesh. Nazmul Hossain - Find Nazmul Hossain of Bangladesh Cricket Team complete player profile, number of matches, runs score, wickets & catches, Statistics, Records, Nazmul Hossain Latest News, Nazmul Hossain Videos, Nazmul Hossain Photos, and other Nazmul Hossain Cricket Team players.